24 January 2017, at 12:00a.m. Once figures were adjusted to account for the change in Defra reporting methodology earlier this year, production edged less than 1 per cent ahead of year earlier levels, to reach 908 thousand tonnes. However, this small increase was influenced by the extra working day in 2016, which was a leap year. Nonetheless, this meant pig meat production surpassed beef for the second year running, a trend which had previously not been seen since 2003. However, the annual increase was almost entirely driven by the first half of the year, as production actually fell behind year earlier levels for the latter five months of 2016. Clean pig slaughter averaged 4 per cent above year earlier levels during the first four months of 2016, which elevated production and put considerable pressure on pig prices. Consequentially, sow slaughter numbers were also very high at this time, averaging 12 per cent above year earlier levels. Moving into the second half of the year, the legacy of low prices began to have an impact on production levels. 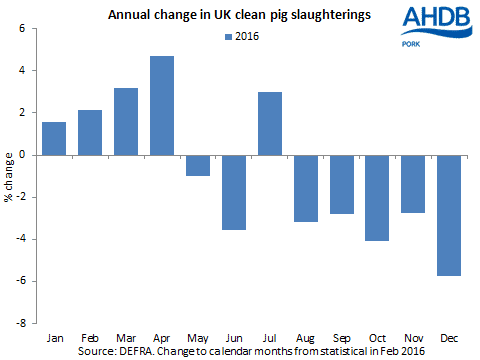 Clean pig slaughterings first fell below year earlier levels in June, and subsequently averaged 3 per cent below 2015 levels. For December alone, clean pig throughput was 6 per cent down on the year, which contributed to a 5 per cent year-on-year fall in production during the month. The decline in clean pig slaughterings as the year progressed counteracted the earlier elevated numbers, leaving overall throughput for 2016 stable on the year at 10.6 million head. Conversely, sow slaughter was elevated for the year as a whole, up 3 per cent on 2015 levels at 254,000 head. This contributed to the overall increase in pork production. However, improved producer profitability has depressed sow slaughter in the latter half of the year. For December alone, sow slaughterings were 9 per cent below 2015. Average carcase weights continued the long-term trend and were higher in 2016 relative to the previous year, averaging 82.2kg. This also influenced the overall increase in pig meat production. Weights were up throughout the year but were particularly heavy in the early months when poor prices encouraged producers to hold back their pigs. In the shorter term, previously increased sow cullings will likely continue to limit pig meat production. Though moving forwards, the improved price situation compared to last year may ultimately encourage some recovery in production.